I picked up an inexpensive metal cart at Costco recently, which I repurposed as a stand for my Mini Green Egg. It’s weatherproof and mobile thanks to locking casters. It provides a handy place to store the various baking stones, racks, grids, and smoking woods that previously cluttered up a corner of my garage. I used an angle grinder to cut an Egg-sized hole in the top shelf, so the cooker is securely held in place while the cart rolls around. The “rolling” part is important to me these days. I moved, and my new house has a screened-in back porch far too nice to pollute with barbecue smoke. So I roll my Eggs out from beneath the porch ceiling before I fire them up. (It’s a good idea, not just for tidiness, but for fire safety reasons as well.) Now I can relocate my cookers according to wind and weather–it’s like an outdoor kitchen on wheels! Two medium-sized blocks of cheese carried by Costco have a permanent place in our cheese drawer. One is the wedge of pecorino, and the other is the Coastal cheddar. 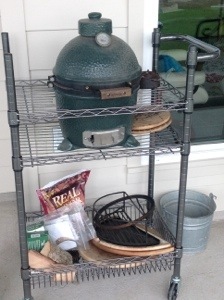 Your mini-BGE cart is awesome. Is it a little top heavy or does all the stuff in the bottom help balance it out? We just got our Costco last November and we like them best for prime beef. They don’t have a lot of it (no brisket) but I can usually get prime ribeyes or strip steaks. I think Costco has better homegoods stuff than Sams, too. Not top heavy at all. The cart has big, sturdy casters at bottom, and the second shelf is set low enough to make it stable. I’m working my way through a huge block of Costco parmesan reggiano. It’s making me want to shave it over *everything*.